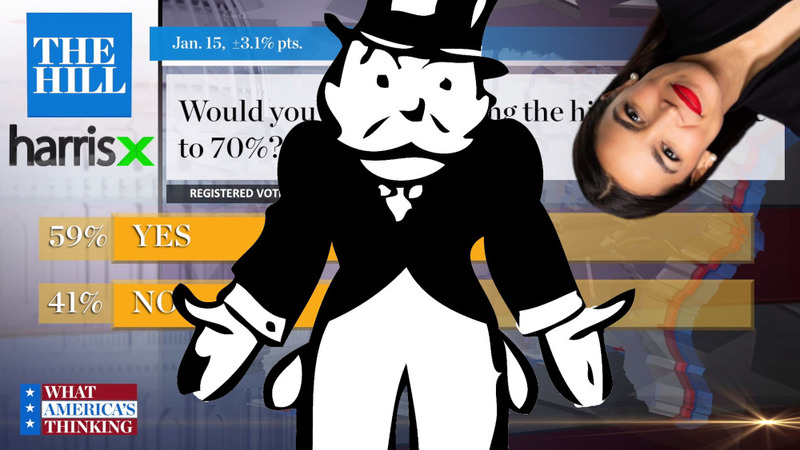 During a 60 Minutes interview Alexandria Ocasio-Cortez casually mentioned that she thought that America's super-rich should pay a marginal tax-rate of 70% on annual earnings over $10,000,000 (which is a better deal than they got under Reagan); since then, the proposal has roiled the political classes and billionaire-backed news outlets, who coincidentally oppose taxing billionaires. Though the establishments of the Democratic and Republican parties have scrambled to brand this proposal "unworkable" and "radical," there's another group of people who really like the sound of it: voters, including Republican voters. A newly released Hill-HarrisX poll found that 59% of registered US voters support the proposal, and that breaks down to 62% of women, 55% of men, 57% of southerners, 56% of rural voters, 60% of independents, 71% of Democrats, and even 45% of Republicans. The establishment has attributed AOC's incredible reach and influence to many factors -- her physical attractiveness, her ignorance, or some kind of witchy, indefinable charisma. As compelling as all those dismissive reasons may be for the people who mouth them while rocking back and forth with their eyes screwed shut, there's another possible explanation that this poll bears out: "She’s preaching popular, common sense, underexpressed messages. But honestly, would a new member of Congress be so dominating the national conversation, if other Democrats were either less clueless or less beholden to their donors?" My favorite part of this debate are the bootlickers who insist that it's impossible to tax rich people because they'll just hire procurers and enablers to hide their money in the Irish Sea, the English Channel, the Caribbean, Luxembourg, Wyoming, and Delaware. This counsel of despair is awfully convenient for the oligarch class, but it's belied by the energy that the super-rich pour into the project of keeping the top marginal rate as low as possible. Either they're doing this because it breaks their hearts to see Uncle Sam try so hard and fail so badly to get them to pay their share, or, just maybe, they know that hidden money is a lot less useful than on-shore fortunes that you can freely claim. In her comments to the CBS show, Ocasio-Cortez referenced tax rates that had once been in place during the mid-20th century. During the 1950s and 60s, the wealthiest Americans were once taxed at a rate in excess of 90 percent. "That doesn't mean all $10 million are taxed at an extremely high rate, but it means that as you climb up this ladder you should be contributing more," she said. The proposal has been met with both criticism and acceptance within the Democratic party. Republicans and conservative commentators have been universally critical, some incorrectly implying that the congresswoman wants to tax all income of the richest Americans at 70 percent.